As soon as I read the first words of Lindsey Lane’s debut novel, Evidence of Things Not Seen, I knew. I would kill the weekend with this book. It’s a slim volume that I could have probably gotten through in a single day in editor-mode. But I was reading for pleasure. So I forced myself to take it slow, to savor. That text from the first of many torn “piece[s] of notebook paper found on the side of US 281” is how Evidence of Things Not Seen opens. I couldn’t help thinking of James Dickey’s novel Alnilam or David Lynch’s Twin Peaks as I read deeper into the secrets of the book’s small Texas town. Like those older works, Evidence is also an opaque mystery, a hunt for a missing teen that dances on the edge of fantasy. The magic in Lane’s story is powerful but shy, preferring to hide in the spaces between. And it takes the form of particle physics. That’s right, I said particle physics. Tommy, the boy who’s disappeared, is a cherished outsider in his community, an eccentric genius the other kids at “Fred High” all look out for, even if they don’t understand him. And he’s really, really into theoretical physics, especially the idea of alternate dimensions. Many of his peers think that’s what happened to him, that he stepped into another dimension. Peppering her story with highbrow physics is just one of the many wonderful ways Lane breaks the rules. Another is the structure. This novel could easily have been marketed as a collection of short fiction. Its a string of eyewitness accounts and standalone stories, each from a different perspective. But I came to agree with the choice to label Lane’s book a novel. It has the requisite long-form arc. Boy does it. Evidence builds like the sound of a passing semi at night. To force the metaphor, Lane’s climax and resolution has the glare and shadow of that speeding big-rig, as well. I recognized it’s power more from the memories and associations her words invoked than from the scene she showed me. If you like neat and tidy endings, this book may frustrate you. It’s risky for a debut novelist to break as many rules as Lane does. But she pulls it off beautifully. For example, her chapter called “The Last Dance” is essentially a short story about an elderly married couple taking a drive. It’s because the wife’s dementia has broken her bond with linear time. She mostly lives as a teen in her mind. Her clear-headed husband, who just wants to stay with her, plays along, drifting hand in hand with her back to the beginning of a long shared history. It’s poignant and tragic and joyful all at once. And somehow, it works beautifully in a book written for teens. Even with all its iconoclasm, Evidence of Things Not Seen does strictly adhere to the one unbreakable rule of novel writing: you can do whatever you want so long as you’re good enough to pull it off. Lindsey Lane’s debut proves she is so much more than good enough. Read Evidence of Things Not Seen. Now. I recently completed an editing gig where I needed an example of why writing a fantasy in a shifting limited 3rd person POV can be risky. Coincidentally, I had also just finished watching the third season of the TV show Game of Thrones. I’ve tried to like the show, I really have. Just like I’ve tried to like George R.R. Martin’sSong of Ice and Fire novels. I even paid full hardback price for the fifth book. Now that I think about it, the thought of that $35.00 I’ll never get back may have contributed to why I found it so underwhelming. Or maybe I’m just old fashioned. Because I believe it takes a great hero to make a great fantasy adventure. Don’t get me wrong, Eddard Stark, Lord of Winterfell, is an incredibly empathetic hero, complex and conflicted, noble yet accessible; he has it all. At least he did until Martin beheaded him. Ever since that moment near the end of the first book, the story has just limped along, sprawling further and further out of focus. I’ve slogged through the whole thing, so I can tell you Martin trots out lots of candidates who vie to replace Stark, but none of them ever manage to seize the mantle of hero and give the reader a character to root for, a focal point. In other words, there’s no one in the story for me to care about. Okay, maybe that’s overstating it. Westeros is peopled with plenty of interesting and sympathetic characters. Tyrion Lannister rocks. For a long time I held out hope that he would step forward as the saga’s new protagonist. Even his brother Jaime started to get sympathetic after his maiming. But Martin refused to center his story on either of them. Instead he just dragged me along, meandering from viewpoint character to viewpoint character until I just gave up trying to figure out whom to root for. Judging from the popularity of the novels and the show, I’m guessing I’m the only person in the world who feels this way. Oh well. I still think I’m right. And I still used George R. R. Not-Tolkien’s saga as my example for how a shifting limited 3rd person POV can fracture an otherwise fascinating story until it reads like a poorly structured history book. (And I enjoy a good history book.) So, thank you, Mr. Martin for unintentionally providing me with a useful editorial tool. Oh, in case you’re wondering, yes, I will probably get suckered into reading the next book. That’s assuming Martin ever publishes it; like winter, he keeps saying it’s coming… But I seriously doubt I’ll spendany money on it. Thank the Seven for libraries. Nikki Loftin is a gifted storyteller. 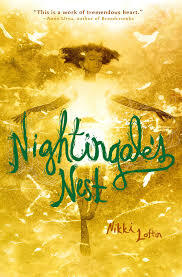 Her sophomore middle-grade fantasy, Nightingale’s Nest, (2014, Razor Bill) proves that. At last month’s Austin SCBWI Working Conference I was fortunate enough to attend Sarah Ketchersid’s (Executive Editor, Candlewick Press) seminar on the importance of raising the stakes for your novel’s hero. Not surprisingly, Nikki was there too. It got me thinking that I’d love it if she led her own class, maybe “Techniques for Torturing Your Hero in Entertaining and Compelling Ways?” Whatever she called it, I would definitely attend. That’s because Loftin intertwines her plots so masterfully with her hero’s desires. No matter how hard Little John tries to do the right thing, his choices just keep making things worse. Nightingale’s Nest is at times heartbreaking and disturbing, but it kept me turning the page to learn if the preteen protagonist would ever catch a break. In addition to her gripping plot, Loftin’s reinterpretation of Hans Christian Andersen’s “The Nightingale” deftly creates a setting and backstory that firmly establish Little John as sympathetic and oh so damaged – again all of the hero’s problems are tangled up in choices he did and didn’t make before the time period of the book. Then she unwinds a chain of events which genuinely and believably threaten to crush him, along with pretty much everyone he loves. Which brings me to the story’s other main character Gayle, the strange little orphan who escapes her abusive foster home by living in a tree and singing. Gayle has magic in the same way Loftin’s entire book has magic. It’s just part of her, it’s not explained or justified. Magic is simply something the world ofNightingale’s Nest possesses in casual abundance. I strive to create that kind of … I don’t know, magicality in my own fiction. Sorry to make up a word, but ‘magical realism’ and ‘fantasy’ don’t really fit what Loftin creates. Her book’s world is very recognizable; the people are just regular folks with familiar, if dire, problems. The setting of Nest has everything a typical suburban/urban preteen would find familiar. Except Gayle. It’s obvious from the first sentence of the book that she’s special, a catalyst. Loftin even goes so far as to call the little girl’s music “magic” in the opening paragraph. And that’s how the author treats the supernatural throughout the rest of the book: it’s matter of fact, no big deal. Just another branch for the reader to hold onto to as he climbs. Nikki Loftin’s skill with plot and world building are enviable and make for a tightly paced and compelling read. And her characters intrigued me and demanded my sympathy in all the right ways. In short, Nightingale’s Nest lived up to the expectation created by her debut, The Sinister Sweetness of Splendid Academy. I can’t wait to see what kind of world she crafts next. Five hundred words, that’s all I needed. But a million little disasters distracted me. Compared to what a lot of people deal with, they’re not really disasters, at all. I know that. But knowledge of relative scale had ceased to provide much relief or solace after what had now been several months of low level stress and petty catastrophes. And it certainly didn’t help me focus on coming up with those five hundred words I needed for the next day’s deadline. I sat in the shadowy glow of a blue running light upstage during Act One of Tosca at the Long Center (I work as a stagehand). I had just given up on writing. Seconds before, my computer had sighed a tiny almost-beep and gone blank in my lap. Its fans had stilled for the final time. The battery status indicator kept flashing once green then twice red, once green then twice red, once green then twice red. I knew its brain had fled this mortal realm. The little flashing light was merely leftover electricity with nothing else to do. My faithful machine’s last heat drained into the tops of my thighs. I pulled the power cord out of its back. The little light flashed one final time and went dark. Surrounded as I was by my fellow stagehands, I silently swallowed against my tears and slid my laptop’s corpse into my bag. All I could think about was my WIP. It had been at least a month since I backed it up. I knew I could never exactly recreate all of the small scale tuning of my narrator’s voice that I’d been doing in that time. I read the first paragraph and snorted. Ha! I thought. This ought to be good. But his thesis, that it’s more useful to view “imposed limitation – in ideas or images, as well as in actual time to create” as a positive tool for a writer, intrigued me. And it certainly had specific relevance to my situation. Some context might help. Here’s a partial list of some of what’s been eating at me since the end of last year. The first minor disaster was the partial flood of my house that required me to pull half the floor out, dry it, and reinstall it. But there have been several ongoing stressors, too. Our hot water heater has been agonal for over a year. Several plumbers have warned me it’s in its final (though hopefully still pre-dramatic-explosion) death rattle. There’s also the older, even more feeble washing machine. Getting back to discreet catastrophic events, we had a break in the main water line into our house, two tile installers who haven’t actually installed any tile in our only shower, a furnace that broke down twice, and a bunch of other annoyances. The most recent of which was the death of my computer in the dark, surrounded by Puccini’s beautiful music. And here’s this guy telling me I just need to turn my problems into my solutions. I won’t lie; I briefly entertained some uncharitable thoughts for Mr. Cunningham. But I kept reading. I couldn’t help it. His premise that “resistance to its production [is] what makes good art good” intrigued me. The argument has a compelling logic that I just couldn’t refute. 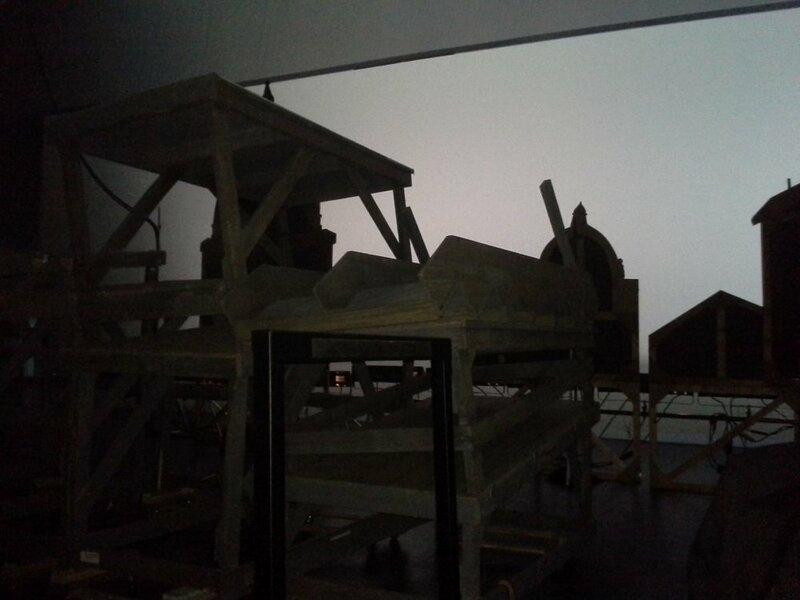 So I stared into the silhouette of the Act Three ground row I sat upstage of, and I despaired. I had lost my last excuse, my best justification for not writing. If lack of time (or computer), if the myriad distractions occupying my conscious mind, were not the reason I had stopped writing, then what was? Only one answer seemed plausible: I had reached the first true test of my commitment to my writing life, and I had failed it. I finished the article anyway. What the heck? I thought. It’s not like I had anything better to do. In the second half of his piece Cunningham delves into the role of the conscious vs. the unconscious mind in the writing (or any creative) process. He defines that moment all writers face when we must simply stare at the blank screen or page and hope something comes as “a practice of faith.” And he’s right. So I said another aimless prayer. I put down the magazine and picked up my notebook and pen. Whatever emotional cocktail I experienced at that moment sure didn’t feel like faith. But it wasn’t despair, either. So I kept staring down at the white paper in my lap. I kept my lucky pen poised. I noted how the blue backstage lighting had rendered the lines of the page nearly invisible. Then I pressed the tip of my pen to the paper. I just finished Matt de la Peña’s We Were Here (Delacorte Press, 2009). Not surprisingly, it kind of rocks. Don’t worry; this isn’t a review of a not so new book that you’ve probably already read. I only mention it because it’s a great example of inevitability. In case you haven’t gotten to it yet I won’t go into specifics, but the big reveal is far from surprising … in a very good way. Same with the novel’s ending. The reason I didn’t mind figuring out the ending pretty early on is that de la Peña’s plot has inevitability. The hero’s choices drive him into increasingly difficult situations until he has to eventually confront the source of his self-inflicted torture. So always being aware of the story’s inevitable conclusion in the distance fits We Were Here‘s rough, urban journey. I found myself experiencing a growing satisfaction as I trudged alongside the book’s hero knowing where he was headed even when he didn’t. Paradoxically, and this is what I love about de la Peña’s writing, this dramatic irony also turned out to be the source of most of the story’s tension for me. I knew what the hero needed. It was painfully obvious. So I wanted to grab him by the scruff of his neck every time he took a step in the wrong direction. But in the end, the hero figured out the right course all on his own. He achieved redemption because he chose to. Like a worried parent, I could breathe again, my child had made it across the tightrope without my help. And then there’s predictable. I’m talking bad TV sitcoms here. Unlike a story with a strong, inevitable ending, what the reader/viewer sees coming in a predictable plot isn’t really connected to the hero. It’s an outside force instead of a consequence of the hero’s actions. Therefore it feels like a cheat and leaves readers or viewers wanting more. Or worse, it leaves them wishing they’d never gotten suckered into the experience in the first place. Okay, so we’ve established that we like inevitable endings and that tying our plot twists and crises to our protagonist’s choices helps us achieve them. Well, I’m hoping you’re with me on this; maybe my previous sentence should have been in the singular. Either way I shall plunge ahead. Achieving inevitability instead of predictability also hinges on how delicately an author deploys the little signposts that get the reader wanting the ending everybody’s moving toward. A delicate balance must be struck. If de la Peña had peppered as few as one or two more bits of foreshadowing into We Were Here, the book could have ended up as just another formulaic and moralistic walk along an all too familiar adolescent beach. I can’t help but imagine some early draft of the novel that looks precisely like that. Okay, I’ll admit it; Ihope that cliché early draft exists with all its flaws. I like to imagine it lying bloated at the bottom of some file drawer in Matt de la Peña’s office: an unremarkable stack of dusty pages held together by a single, overtaxed rubber band around its middle like a hobo’s belt. It’s petty, I know. But it’s an image that makes me feel better about my own writing process.